I don’t know what kind of grasshopper is, but it sure is pretty. We saw it tonight on an evening walk outside of Andasibe National Park. Of course, it’s possible that it’s a katydid. After all, it’s antennae are almost as long as its body, while grasshoppers tend to have stubbier antennae. But the little white points on its legs, like teeth of a comb, make me think it’s a grasshopper. 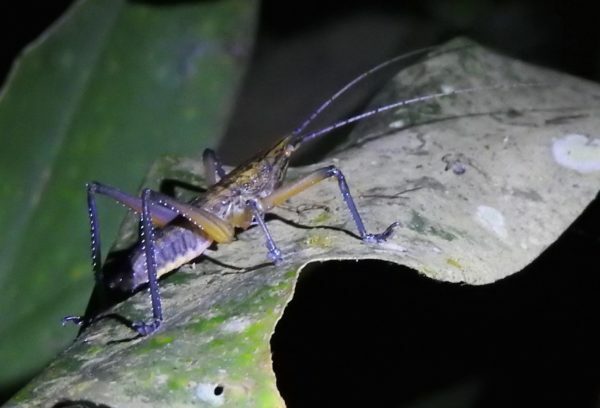 Grasshoppers make music by rubbing their striated legs together, while katydids make music the way crickets do: by rubbing their wings together. You can read more about telling grasshoppers and katydids apart at Grasshopper or Katydid? on the Amateur Entomologist blog.